The first nucleus of the city developed around a Sican village, later ca11ed by the Greeks Drèpanon (sickle), possibly because of the sickle-shaped form of its gulf.In the 8th c. it became a Phoenician port of call and, in the first Punic War, a Carthaginian strategic base. After the victory of Lutatius Catulus off the Egadi islands, Tràpani became civitas romana, and under the Romans its livelihood depended mainly on trade and maritime activities, without however ever playing a particularly important role. In AD 440 Tràpani was invaded by the Vanda1s, in 477 it fell to the Byzantines, and in about 830 it was taken by the Muslims, who made it one of the richest and most prosperous cities in Sicily, developing its maritime activities and its gold and cora1 handicraft. The process of Islamization was so profound that it is still evident today in place names and in certain local traditions and customs. Trapani continued to prosper under the Normans, who conqueredit in 1077, and elevated it to the rank of a royal city. In 1282 it took part in the uprising against the Angevins (the War of the Sicilian Vespers) and thus got caught up in the war between the Angevins and the Aragonese. Between the 13th and the 15th c. the city layout was extended with the construction of new quarters and new streets and squares. In the late 16th c. the city began to decline. In the following century, under Char1es V, the town walls were fortified and provided with massive bastions. Trade prospered again and further developed with the production of salt. Many new salt-pans were created, some of which are stilI active even today. However, despite all this, the 17th c. was mostly a period of virtual economic stagnation and general decline. Tràpani became the provincial capital in 1817, a position it still possesses. It participated vigorously in all the uprisings against the Bourbons and in 1860, even before the arrival of Garibaldi and his army, obliged them to flee from the city. Tràpani was extensively bombed in World War II, and large parts of the modern city are quite new. 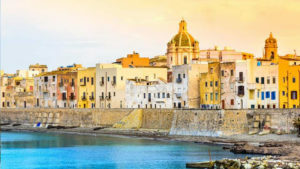 If we arrive in Trapani via the motorway we should start our visit with the Santuario dell’ Annunziata and the Museo Pèpoli in Via Conte Agostino Pèpoli, which is on the way into town. If we arrive by train, we should proceed to the spacious Piazza Vittorio Emanuele, the new city centre, where we can see the Fountain of the Triton, by the Trapanese sculptor Domenico Li Muli (1951), opposite which is the statue of Vittorio Emanuele II, by Giovanni Dupre (1882). We can now go along Viale Regina Margherita, which flanks the Villa of the same name, a fine public garden laid out in the 19th c., rich in splendid plants, including some majestic ficus trees. We thus get to Piazza Vittorio Veneto, with the War Memorial, and we see on the right Palazzo D’ Alì (early 20th c.), the seat of the Town Hall, opposite which is the Post Office, a building in art nouveau style designed by the architect La Grassa. Weenterthe old town by way of Via Garibaldi (formerly known as Ruga Nuova, dating from the 13th c.), where a number of very dignified 18th c. buildings still stand, as for example Palazzo Adragna-Riccio, which has some fine statues on the façade and, in the interior, a salon with an elegantly stuccoed ceiling, floor-tiling of local manufacture. Nearby is the Chiesa di Santa Maria dell’Itria, with a fine baroque facade and further along is the Chiesa di Santa Maria del Soccorso, which adjoins the Convent of the Badìa nuova, built in the l5th c. and alrnost entirely restructured in the 19th c. It contains baroque choir stalls and an l8th c. floor . A little further on, in Via Sieri Pèpoli, is the Chiesa di San Nicolò Mirense, also called di Bari. In a sloping sideroad is the Chiesa di San Domènico, originally built in the 14th c., which is the period the fine rose-window in the façade dates from. Inside the church there are a fresco of The Madonna andChild (15th c.) and the tomb of Manfred, the son of Frederick III of Aragon. Also of interest are the Pèpoli Chapel, used for funerals, and a variegated marble baroque chapel, the work of the Trapanese sculptor Giovanni Biagio Amico, which has a 14th c. wooden crucifix over the altar .The church contains the wooden groups of the Misteri (Mysteries) (18th c.), which are bome in procession on Good Friday. Retuming to Via Garibaldi, we come to Via Torrearsa: on the right is Piazza Mercato del Pesce (Fish Market Square) with a fountain and a statue of Venus Anadyomene; on the left, at the junction with Corso Vittorio Emanuele, stands the 18th c. Palazzo Cavarretta, with statues of the Madonna, St John and St Albert, Trapani ‘s patron saint, and two clocks added in the mid-19th c. To the left of the pa1ace you can see the Porta Oscura (Dark Gate) and the Clock Tower, with its thirteenth-century sundial. On the left, in the Corso, is Palazzo Riccio-San Gioacchino, built in the 15th c. and frequently redone. On therightis the 17th c. Chiesa del Collegio dei Gesuìti which has a magnificent baroque façade on two orders, of great scenographic effect because of the abundance of decorative elements. In the interior, which has a nave and two aisles, there are some notable 18th c. variegated marble altars and in the high altar a bas-relief by Marabitti representing the Virgin Mary. The sacristy cabinets are beautifully carved works by Pietro Orlando. Further along Corso Vittorio Emanuele, on the right, is the Cathedral, dedicated to St Laurence and built in the 17th c. over a pre-existing 14th c. church. The interior has a nave and two aisles, divided by columns; it contains some funeral monuments and a crucifix attributed by some to Giacomo Lo Verde and by others to Van Dyck. In the second chapel on the left, the coat of arms of the city of Genoa tells us that the Chapel of the Genoese community used to be situated here (formerly it was in the Chiesa di San Francesco). A little further on, by way of Via Giglio, we come to the Chiesa del Purgatorio (1683). It was damaged in World War II and restored. The façade, adomed by statues, is the work of Giovanni Biagio Amico (1712). Nearby is the Chiesa di San Francesco, a single-nave church redone in the 18th c. The original structure dates from the 13th c. The Genoese community had its seat here (chapel and tombs). In the left part of the transept is an interesting tomb belonging to the Ar menians residing in Trapani, with a bilingual inscription in Armenian and Latin. Among the various 18thc. paintings here is one of St Clare and her companions, by Domenico La Bruna, a painter from Trapani. Proceeding along Via Corallai, we come to the Torre di Ligny. This massive quadrangular-plan tower, put up in 1671 by Prince di Ligny, houses the Museo della Preistoria e Protostoria, which has an interesting display of material from all over Sicily (The Museum is well supplied with illustrative panels, graphs and photographs). From here we come to the seafront, Viale Regina Margherita, which looks towards the port where, on two little islands, we can see the Lazzaretto (Lazar house) and the Torre della Colombaia (Dovecot Tower), a 14th c. fortified building that has been extended over the centuries. Now, passing Piazza Garibaldi and the Garibaldi Monument, we come to the Fontana di Saturno (Fountain of Satum), in a little square named after the fountain. Nearby is the Chiesa di Sant’ Agostino, now used as an Auditorium. This church was built in the 14th c. but has been so often altered that its original appearance is much modified. Of the original building we can see the beautiful façade, characterized by a portal with concentric pointed arches, surmounted by a stupendous rose-window. The Biblioteca Fardelliana, founded by G. B. Fardella in 1830, is in the nearby former Chiesa di San Giacomo, 18th c. This 1ibrary possesses numerous precious vo1umes, incunabula and 14th-15th c. manuscripts. Now, by way of Via San Pietro, we come to the Chiesa di Santa Marìa di Gesù, built in the 16th c., together with the adjacent convent, in Gothic-Renaissance style. The interior, with a nave and two aisles and po1ygonal apses, contains a graceful image of the Madonna degli Angeli, in glazed terracotta painted by Andrea della Robbia, and a baldachin by Antonelo Gagini (1621), together with some 18th c. paintings by local artists. In the old Jewishquarter, around Via Giudecca, stands the 16th c. Pa1azzo dela Giudecca, a building in typical plateresque style, with diamond shaped ashlars and an ogival portal. From here, retuming to Piazza Vittorio Emanuele, we can see the long thoroughfare Via Fardella, which at a certain point forks and continues to the right as Via Conte Agostino Pèpoli. Here we can see the Santuario dell’Annunziata, a splendid work of architecture: the original building is 14th c., a rose-window and a portal are 15th c., there are 16th c. statues of the Madonna and the Angel, and the campanile dates from 1650. Inside, in the far left, is the splendid Cappella dei Marinai (Sailors’ Chapel), built in the 16th c. and with 18th c. additions by Giovanni Biagio Amico. The 15th c. Cappella dei Pescatori (Fishermen’s Chapel) contains numerous votive offerings made by fishermen miraculously saved from shipwrecks. Also noteworthy is the Cappella della Madonna, which is reached through two 16th c. portals behind the high altar .The figures of the Prophets and of the Everlasting Father, done by Antonino and Giacomo Gagini in the years 1531-97, are represented in a great marble arch. In the high altar, which is decorated with variegated marble, beneath a baldachin, there is a splendid statue of the Virgin and Child; this is la Madonna di Trapani, particularly venerated by the population of Trapani. This work by Nino Pisano (14th c.) is a veritable masterpiece of sculpture because of the harmonious balance of the form and the exquisite sweetness of expression. At the foot of the statue is a view in silverwork of the city. Adjacent to the Sanctuary is the building that used to be the Convento dell’ Annunziata and is now the seat of the Museo Regionale Pèpoli, reached through Villa Pèpoli. The Museum began with some 19th c. collections and was later enlarged with donations from General Fardella and Count Sieri Pèpoli. It contains archaeological material, a collection of sculptures and paintings, and a section devoted to the applied arts. On the ground floor there is a vast room with statues of the Gaginesque school; in one section there are inscriptions in Arabic. We reach the first floor by way of a magnificent stairway decorated with variegated marbles. Here we find the picture gallery, which among many other works possesses a polyptych representing the Madonna and Child crowning St Catherine; at the sides there are Saints, with the Deposition in the predella. This is the work of the early 15th c. Maestro del polittico di Trapani (the Trapani polyptych master). A panel painting representing La Pieta’ (1380) is a veritable work of art by Roberto di Oderisio because of the intensive expressiveness of the figures represented and the dramatic nature of the whole presentation. Various paintings are displayed in the other rooms, ranging from the 15th to the 18th c., among which the most remarkable are those ofthe Neapolitan school (landscapes, stilllifes) and the Dutch. There is also an exceptionally fine canvas by Titian (1530), representing the stigmata of St Francis. There are many interesting coral items: jewels, church fumishings, and the delightful figures of a Nativity scene in a glass case, all testifying to the heights of artistic skill attained by the coral craftsmen. A separate section is dedicated to Nativity scene figures made of canvas, glue and cardboard; some are genuine works of art by sculptors like Matera and Tipa. Leaving the Museum and retuming to Via Fardella, we come out at the end of the street once again on the seafront, and from here we can leave the city and visit the Museo del sale (Salt Museum), for Trapani is also a city of salt- pans, now a nature reserve, with their characteristic old windmills.